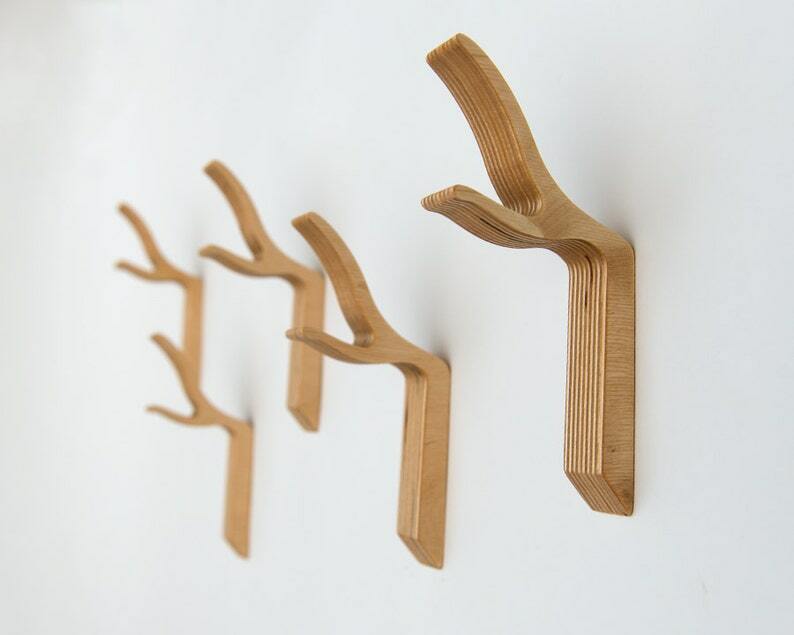 Modern yet sculptural and organic our stylized twig hooks make a striking perch for coats, bags, hats, towels and umbrellas. They look especially dramatic when grouped in multiples, either in a straight line or at varying heights (consider hanging a combination of small and large hooks at different heights in one area). This is our SMALL size, which works well for less bulky items and in kids' rooms. Handmade in our Caledon, Ontario studio. ***Price listed is PER hook - you can purchase multiples by changing the quantity in your shopping cart. If you require a greater number than is available thru this listing simply convo us and we'll make you a custom listing. Crafted from Baltic birch plywood these are extremely strong due to the many thin layers of wood in this high grade material (we've tested them to hold 15+lbs). Finished with multiple coats of hand-rubbed tung oil finish, which brings out the many colour variations in the different layers of wood. Each hook measures approximately 6.5" in total height, protrudes from wall 3.25", is about 1" thick (16.25cm x 8cm x 2.5cm) and has 2 keyholes on the back for hanging. **Please note that we do not provide hanging hardware since the type you will need will depend on the type of surface these are being attached to. Because coat hooks need to carry substantial weight we recommend using plugs or anchors appropriate for the material your walls are made of, along with corresponding screws - your local home improvement store should be able to advise you here. *MADE TO ORDER - please expect 1-2 weeks before your order can be shipped. In order to keep shipping charges as low as possible we ship this item via Canada Post Small Packet Air Mail, which does NOT come with a tracking number or guaranteed delivery date, but is economical and very reliable. If you would like to upgrade shipping in order to have a tracking number, please convo us with your location for a quote (but expect to pay significantly more). *EXCEPTION - for Canadian destinations we do not have the Small Packet option and therefore must ship with a tracking number, hence the higher Canadian shipping cost listed here. All artwork, photos, text and creative contents are copyrighted by Patrick Lajoie and Mara Minuzzo for Liscious Inc 2011. All rights reserved. Très simple, très beau : parfait ! Beauty meets function in these unique wall hooks. We love them and cannot wait to add them to our entry way! Beautifully packaged. Delivered quickly. Craftsmanship and attention to detail make these truly lovely. We accept payment by credit card, debit card, Etsy gift card and Paypal. Customers with a shipping address within Canada will be charged current provincial and federal sales tax rates, as is required by law. All customers with a shipping address outside of Canada will not be charged tax by Studio Liscious BUT should note that they may be assessed and charged tax and/or duty by the country/state they are having their purchase shipped to. NOTE: The buyer is responsible for any additional fees (taxes/duties) that may be charged by customs in their country. Purchases shipped to the USA or Mexico are exempt of duty (but not necessarily tax) since they are protected under the North American Free Trade Agreement. We make every effort to represent our products accurately thru our photos and item descriptions - however if you are not happy with your purchase please let us know within 7 days of receipt of shipment. Any returns or order cancellations must be authorized by us and returned items must arrive back to us in original condition (unused and undamaged). Returns and order cancellations may be subject to a 10% or $5 (whichever is less) processing/re-stocking fee. Shipping charges are not refundable and any refunds on returns will be minus either the shipping charge on the order or the ACTUAL shipping cost to us, if it is higher than the shipping charge on the order. Return shipping costs are the responsibility of the buyer. For exchanges requested by the customer, the customer will be responsible for any additional shipping charges involved in both returning the original item and re-shipment of the exchange item. Custom orders and Sale/Clearance items are final sale. Returns on made-to-order items are considered on a case by case basis - please contact us to discuss options. Except for larger furniture orders, we ship worldwide with Canada Post, as well as occasionally with Fedex within Canada and the US. In order to keep shipping rates reasonable most of our items do not include tracking or delivery confirmation (unless otherwise noted in the listing description). We have found the postal system (both within Canada and internationally) to be very reliable and have yet to experience a lost package - however, in the event of such an occurrence we will make every attempt to resolve the issue on an individual basis. If you would like to upgrade your shipping option to have tracking and delivery confirmation (and usually faster delivery time), send us a convo before ordering so that we can let you know what the extra cost would be, and then make you a custom listing with the upgraded shipping. We ship to the 'ship to' address shown on your Etsy order. When placing your order please make sure it is the correct address you want your order shipped to, as we cannot take responsibility for incorrect addresses provided to us. US shipping rates apply to the contiguous 48 states only. US customers located in Alaska and Hawaii please note that there will likely be an additional shipping surcharge above the US flat rate shown in our listing. Please convo us to find out what your actual shipping cost will be. If you place your order without doing so we will contact you afterwards to let you know about any additional shipping surcharge. We ship items in either a sturdy bubble pack envelope or a cardboard shipping carton, depending on the item(s) to be shipped. All items are carefully packed to protect them from being damaged in shipping. In the rare event of damage occurring please contact us with photos and we'll do our best to help remedy the situation on an individual basis. Normally, items we have in stock we try to ship within 2-5 business days from date of purchase. However, as specified in some of our individual listings, certain items are made to order and have a lead time specified in the listing description. Some items also have specific shipping details which are described in the listing description as well. Everywhere Else – approx. 1-3 weeks unless noted in the listing as Surface delivery which takes about 6-8 weeks. Note: Delivery times for shipments going outside of Canada are estimates since they depend largely on the amount of time Customs (in the destination country) takes to clear the package as well as the efficiency of the postal service in that country. We do label all shipments clearly with the proper customs forms, etc, in an effort to avoid any unnecessary delays at Customs but we cannot guarantee a specific delivery time or date. All images, text, artwork and designs are copyrighted by Liscious Inc.